Gravityforms is a great plugin for WordPress which allows you to add powerful forms to your website, with add-ons for just about everything under the sun from eCommerce to running a voting system. One add-on I used recently was the Polls Add-on, and after it was all set up, it worked like a charm. This approach is straightforward, set a cookie on the users computer so you know when they’ve voted. It also comes built-in with the Poll Add-on by Gravityforms which makes it super easy to implement. Seems to make more sense… take control away from the client side and limit users by IP. It’s more powerful because users can’t game the system as easily. The only way would be to connect to a VPN or other service which hides/changes their IP address. The Problems: First, consider this scenario: you have a router at home and there are 3 computers in your house. All 3 of those computers are connected to that router, and though they each have separate local IP addresses, they are all sharing the router’s IP address with the world, so now, you’re really limiting by household, not just IP. The same goes for office spaces. And your users can’t do a thing about it – except for connecting to a VPN or other service which will change their IP. But if this DOES sound like a solution you’re looking for, I recommend heading over to their website and checking out this page. The Problem: There is one caveat however – users can use their different email addresses to vote multiple times. Plain an simple. But that means they would have to put forth extra work to cheat, and since the Poll I was running was not high-profile, I figured this was an acceptable risk, and would still keep false submission to a minimum (there will always be a certain percentage of error in any voting system anyways). I hope this helps, and post a comment if you have any questions/comments regarding this. Thanks for the email solution! I look forward to implementing it on our website because the IP option was out due to static IPs and what not. Cheers! 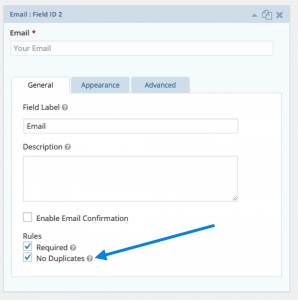 The e-mail solution is so simple but darn perfect! Thanks for sharing this great solution. 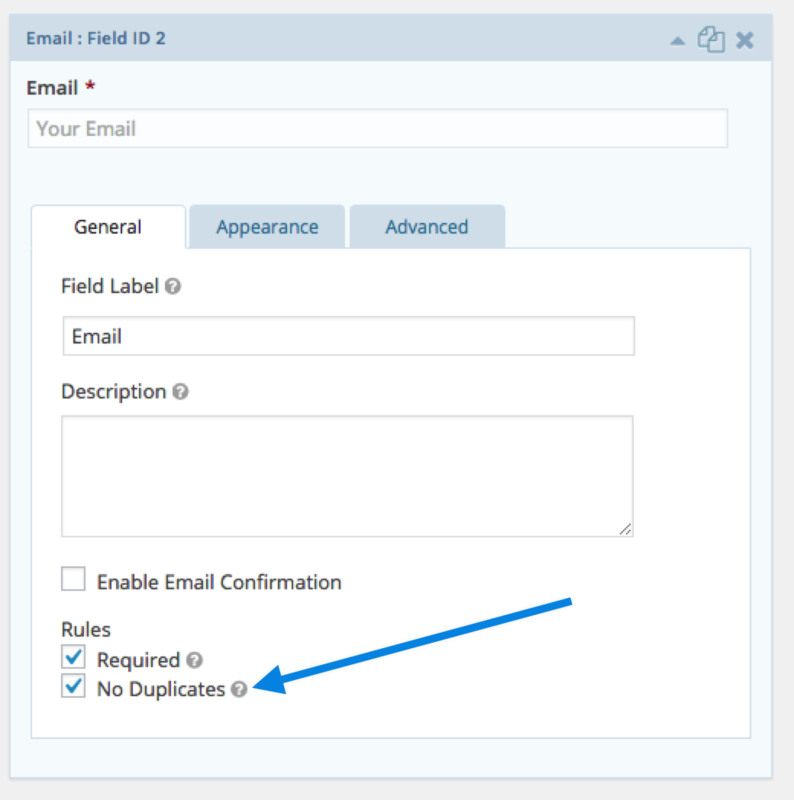 Have you checked that Gravityforms is up to date, and that the email field is required?